A pair that consists of a silly, carefree or simply lighthearted parent (almost always a father) and a son who is down to earth, snarky, brooding or all three. In addition, the parent will often be utterly embarrassing. Expect Awkward Father-Son Bonding Activity to pop out, which will usually end with an Aw, Look -- They Really Do Love Each Other moment. 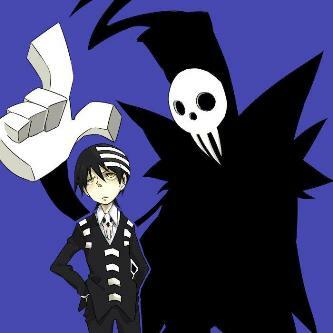 Soul Eater has the Cloudcuckoolander Shinigami and his serious, Super OCD son Death the Kid. They provide the page image. Haruhi Fujioka in Ouran High School Host Club is the most reliable and level-headed character in the show. Her father Ryouji aka Ranka is a flaming transvestite with emotional issues. Chrono Harlaown was by far the most stoic character in Magical Girl Lyrical Nanoha. His Hot Mom Lindy, on the other hand, skirts it very close to a Bunny Ears Admiral. Bleach: Ichigo and his Amazingly Embarrassing father, Dr. Isshin Kurosaki. Unless Isshin drops his Obfuscating Stupidity facade, yeah. FLCL. Naota Nandaba is fairly normal (at least for a child in anime) but his father Kamon is extremely immature, suffers emotional mood swings and exhibits inappropriate sexual behavior. The adult comic Viz includes the comic strip "The Modern Parents" by John Fardell. It is the satire of an extremist "green"/New Age couple and their antics, while their young son is the Only Sane Man. Septimus Heap has Bumbling Dad Silas Heap and Only Sane Boy Septimus Heap. Twilight: The brooding (very brooding) Bella and her mother, Rene. Buffy the Vampire Slayer: The Mayor is always cheerful and upbeat, even when planning his Ascension, while Faith, whom he treats like a daughter, is generally brooding and aggressive. Absolutely Fabulous featured bumbling, selfish, impulsive, party girl mother Edina and her long-suffering, Only Sane Woman daughter Saffron. A female version is provided by Susan Mayer and her daughter Julie in Desperate Housewives (at least, before Julie left Wisteria Lane). Rick Castle and his daughter Alexis from Castle. Respectively, Walter and Peter Bishop from Fringe. Lisa and Tia Landry in Sister, Sister. Her long-lost twin sister Tamera and her father have the opposite relationship. Final Fantasy VIII: Though they don't know it, Laguna is Squall's father. Squall is brooding, stoic and professional while Laguna is a Bunny Ears Lawyer who tends to misuse words and in general is a total loon. When Squall first meets Laguna by experiencing his memories in a dream, Squall thinks of Laguna as a moron. Goofy and Max, especially in A Goofy Movie. Homer and Lisa from The Simpsons. Phineas and Ferb has Mad Scientist Dr. Doofenshmirz and his deadpan daughter Vanessa. From Daria: neurotic dad, Closer to Earth teenage daughter. Stan and Randy Marsh from South Park seem to be leaning toward this trope in later series, with father Randy getting caught up in the obsession of the episode, and Stan trying to keep everyone relatively sane. This page was last edited on 10 April 2017, at 06:55.